These pave set CZ rhinestones are set very very close (dense) to each other and hence called micro pave set. We carry these in different popular sizes such as 8mm, 10mm, and 12mm round shapes in different color metal such as rhodium finish, dark rhodium finish also known as gunmetal finish, gold finish as well as rose gold finish. Please note that the pictures on this page don't do justice to quality and finish of these beads. 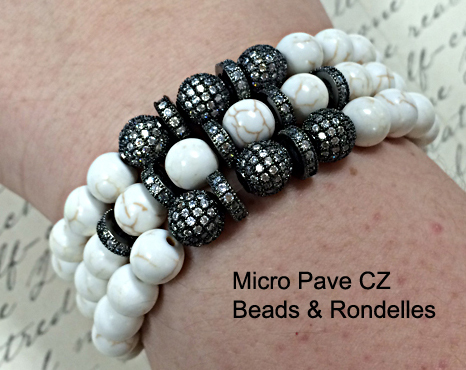 Below is a sample of bracelets made with dark rhodium finish beads and rondelles and bone beads.